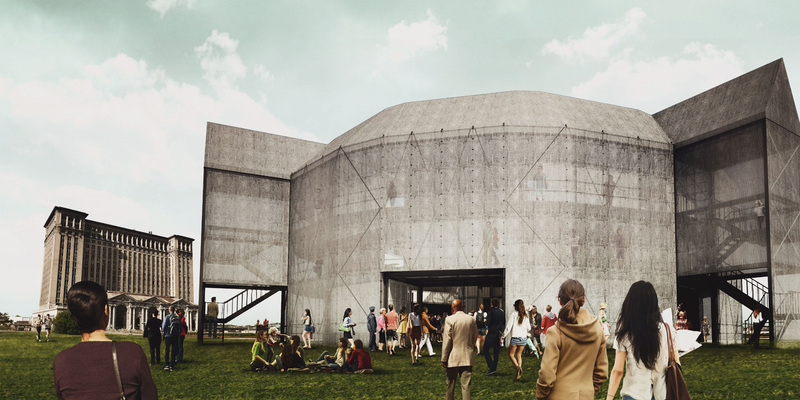 Angus Vail, a rock music business manager from New Zealand, wants to build a Shakespearean Globe Theater in Detroit. But rather than a heavy timber and plaster structure, like the 16th century version, he wants to build it out of shipping containers. Working with New York-based Perkins Eastman, Vail has conceived of a theater in the round that could host everything from Shakespeare to punk rock, both of his passions. Near the same dimensions as the original, the Container Globe would be constructed primarily out of 20-foot shipping containers. These containers would be cut to provided box seating, while additional 40-foot containers would make up the thrust stage. Walkways and stairwells would surround the seating, also like the original layout. 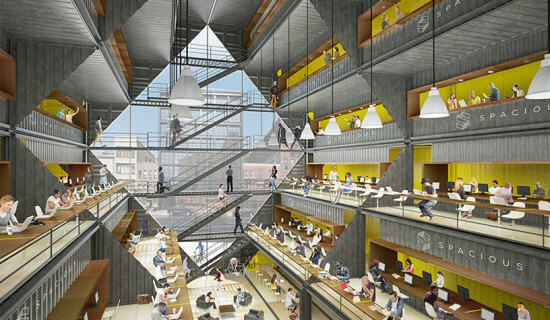 The entire structure would then be wrapped in a flexible steel mesh. Vail has experience in working with containers, including a performance and arts pop-up in Jersey City. His career in the music industry has also given him insight into another possibly of the Container Globe: It could be mobile. Like many large stage shows, the Container Globe would be able to be broken down, packed up, and shipped to its next engagement. Vail says the main advantage of this is that it can be brought into under-served neighborhoods, where access to the performing art may be lacking. Initial renderings show the Container Globe in front of Detroit’s vacant Michigan Central Station. While Vail has named a handful of possible locations for the project, Detroit seems to be at the top of the list. And through the plan is to make the theater mobile, it has not been ruled out that it would be a permanent structure, with multiples of it built around the world. Currently, the team working to bring the Container Globe together is planning a crowdfunding campaign for early this year. A gallery exhibition is also in the works and set to open on February 2nd at ORA Gallery in New York, a gallery dedicated to New Zealand art and design. After the world’s first Taco Bell was saved by preservationists in 2015, it seems the chain has taken a liking to architecture. 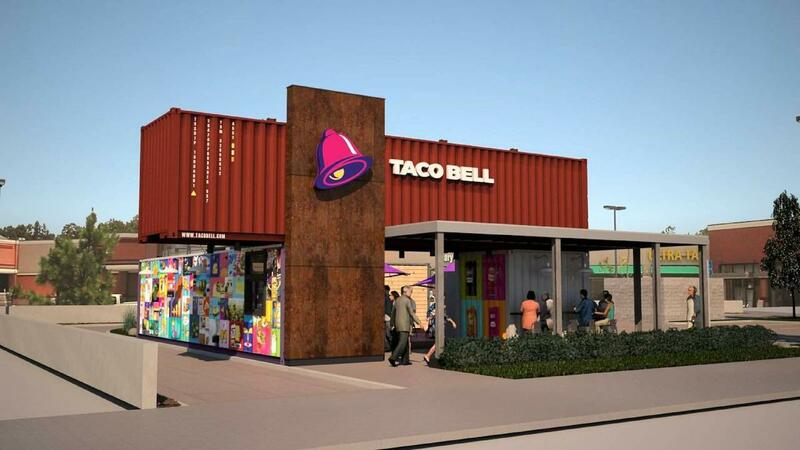 Last year, under the flags #savetacobell and “Save Taco Bell Numero Uno,” T-Bell moved the building from Downey, California, to its headquarters in Irvine after it paraded through Orange and Los Angeles Counties on a truck. 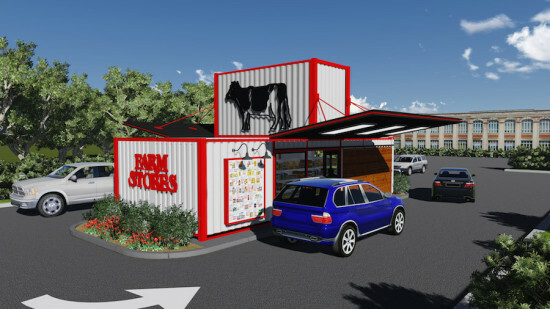 This year, it announced its first shipping container restaurant. Let's just hope there will be space for bathrooms! If you’ve ever wondered what the cross-section of a diamond looks like, step inside this shipping container, where a coruscation of 1,100 shimmering triangular mirrors on various planes refracts light and movement, prism-like. 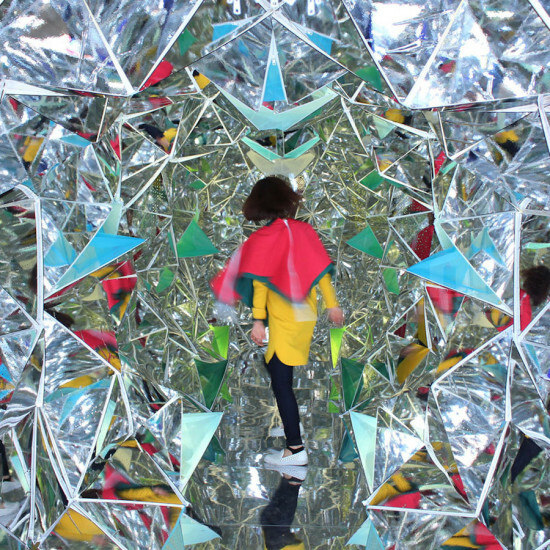 Designers Masakazu Shirane and Saya Miyazaki created a gigantic, walk-in kaleidoscope, stuffing a 49-by-26-foot reflective polyhedron into a 40-foot-long shipping container by cutting the mirrored planes using digital 3D modeling programs Rhino and Grasshopper. Each piece was then fitted with zippers so that the whole structure could fold like origami along the zipper seams. The installation was presented as part of the Kobe Biennale Art Container Contest, a competition in which designers are tasked with making magic happen inside an industrial shipping container—namely, creating an environment worthy of aesthetic merit. With a polyhedron connected entirely by zippers, Shiane and Miyazaki wanted to fabricate the world’s first zipper architecture, proposing it as an environmentally efficient way of dismantling and reassembling in a construction context. “This idea could solve global environmental problems because it is easy to exchange only [one] part with a zipper,” said the designers, who have been honing their origami-influenced zipper technology since 2007. The whimsically titled Wink Space is their third prototype founded on this idea. 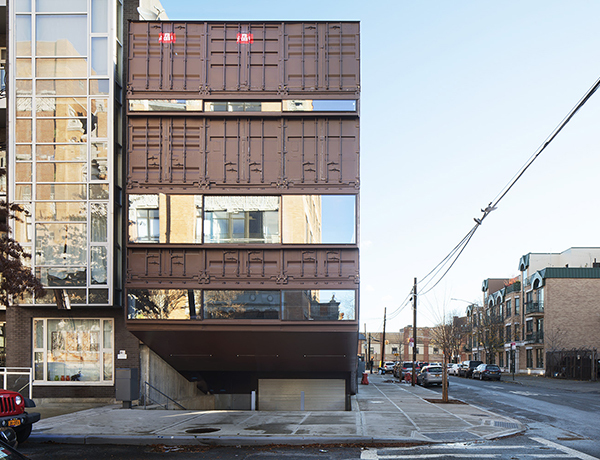 All the interior panels of the structure are connected by detachable cords, and each unit can opened and closed like a window. Each tiny movement viewers make is refracted thousand-fold by mirrors that create a constantly shifting, rainbow-like display. Dress in neon or sequins for maximum effect. Conceptualized as a “cross-functional village” built entirely from shipping containers, the POP Brixton project by Carl Turner Architects offers fertile ground for entrepreneurial endeavors. Aesthetic appeal or lack thereof aside, the interconnected containers will collectively serve as “a community campus for startups, small businesses and entrepreneurs.” Think coworking spaces where creatives commingle and cross-fertilize—only with cultural and educational activities such as workshops, live events, film screenings, and performance arts. Meanwhile, public spaces such as retail outlets, cafés, kiosks, and a speculative hotel are also included in the plan to attract traffic and revenue streams to the South London district of Brixton. 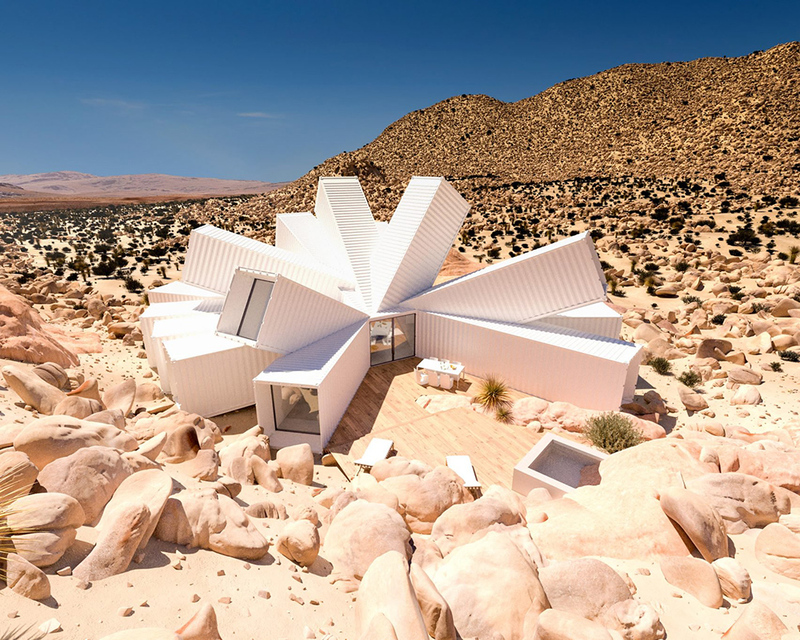 The low-cost, low-energy containers are available in 20 foot and 40 foot dimensions, each one tricked out with high-speed internet access, power points, insulated walls and double-glazed windows. 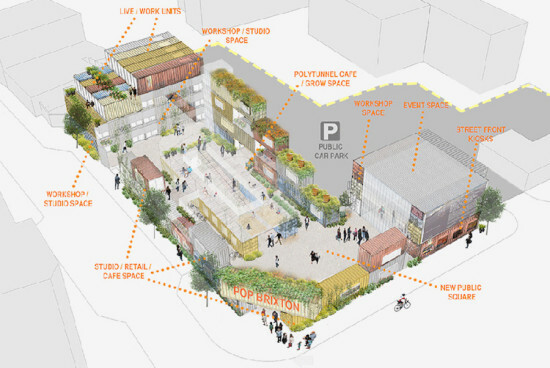 As a self-touted coworking space, POP Brixton will, above all, be a platform for training, business, and employment more than a retail haven, but the containers will be configured around a public square and various planted walkways, and the hosting of events open to all promises to foster community spirit. Integral to the transfer-of-knowledge-and-skills concept is the requirement that tenants partake in a one-hour training program per week for startups, managed by Lambeth College and Brixton Pound. 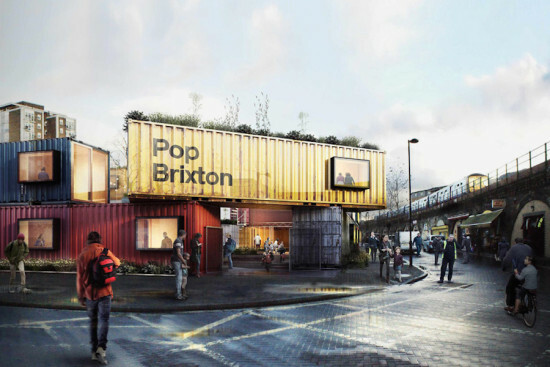 POP Brixton will serve as a pilot project of sorts for its upcoming larger-scale Future Brixton Project. Though not involving shipping containers, it is a community revitalization and job creation initiative that extends to the surrounding Somerleyton Road, Brixton Central, Town Center, and the building of a new Town Hall. Construction of the POP Brixton commenced in January 2015 and is scheduled to open this year. San Francisco's baseball team, the Giants, and Gehl Studio are planning a pop-up shipping container village on a waterfront parking lot just across McCovey Cove from AT&T Park in Mission Bay. The Yard, as the project is being called, will consist of a beer garden, coffee shop, retail stores and a waterfront deck, all on land intended for a 1.7 million square foot mixed-use development called Mission Rock. But until that project begins construction, the 9-acre site, according to Gehl Studio project lead Blaine Merker, will consist of 15 shipping containers salvaged from the Port of Oakland. The containers will line Terry A. Francois Boulevard, some perpendicular to the thoroughfare, some parallel, some stacked one atop the other, and most creating outdoor rooms for congregating. "This is not about a series of buildings, it's an integrated urban design," said Merker. "Our initial inspiration was to create the feeling of a walkable mixed-use street." According to the SF Chronicle, the Giants will spend $2.5 million on the project and pay $77,000 in annual rent to the Port of San Francisco. Until now, the city's most famous pop-up container village was Proxy, in Hayes Valley, designed by Envelope A+D. Plans for The Yard were presented to the Port of San Francisco this week, and the project is expected to open by March, prior to the baseball season. There is an ongoing architectural quest to find new and innovative sustainable materials. Some products could appear in the next science fiction film, such as the fungus-grown packaging material by Ecovative. Other materials have been with us for a long time, under guise of other uses. Some products—like the lowly shipping container—have served one function for so long they beg to be reinvented. 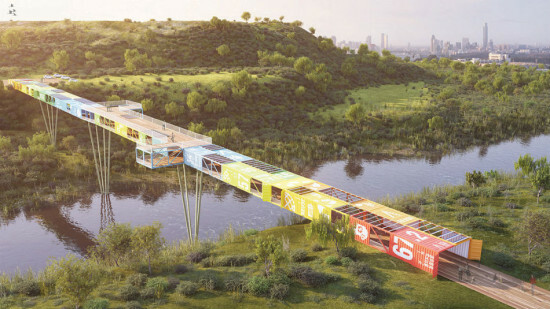 Israeli architect firm Yoav Messer Architects won the Ariel Sharon Park Competition in early ,2013 for a unique pedestrian bridge built from the ubiquitous metal boxes, and with progress underway, the proposal could serve as a new model for reusing the discarded pieces of shipping infrastructure. Serving as the gateway to Ariel Sharon Park in Israel, the 520-foot-long bridge gives this 100 percent recyclable conglomerate waste a new lifeline. Further, the modifications to the containers are done primarily off site to protect the integrity of the environmentally sensitive area. The bridge seeks to integrate the surrounding scenic beauty for pedestrians and cyclists by including observation decks to view the surrounding nature preserve vistas. Pedestrians can also access the rooftop boardwalk by staircases located near the midpoint of the bridge. To overcome ventilation problems, the team added holes in the container walls that double as lookout points. Three tree-column supports hold the the container structure airborne. The project challenges when a product is considered "waste." The demand to divert waste is increasing as landfill space decreases around major cities. If this project is successful, architectural firms may turn to these once discarded containers and ask, "What other needs can they meet?" The Erasmus Effect: Italian Architect's Abroad MAXXI Museum Rome, Italy Through April 6, 2014 The architecture and urbanism of Italy has long been an inspiration to architects from other parts of the world. From the grand tours of Lord Burlington and Thomas Jefferson to the establishment of the American, French, and British Academies, Robert Venturi's lessons learned from Rome, and the enormous influence of Manfredo Tafuri, Italy has been important to how we view architecture and livable cities. But now an exhibition, The Erasmus Effect: Italian Architect's Abroad, opening today at Rome's MAXXI Museum details how the world is enriched when Italian born and educated architects emigrate and find success abroad. The exhibit, curated by Pippo Ciorra, the Maxxi's thoughtful and prolific architecture curator (see his Energy: Oil and Post Oil Architecture Grids.) documents the " journeys, experiences, and stories of the many Italian architects to have found success abroad." This out-bound emigration by Italian architects is, of course, not new, and the exhibit documents the 20th century figures who left the country like Lina Bo Bardi, Paolo Soleri, Romaldo Giurgola, and Pietro Belluschi. The title, Erasmus Effect, is taken from the 1987 European communities exchange program that allowed students on the content to travel to other countries to study. But the exhibit's theme also documents the more troubling issue for the country: the inability of its young architects to have a career in the economically troubled nation. It also questions the problems of trying to actually create architecture in contemporary Italy, and what this means for the country's "brain drain" and future. Erasmus Effect includes projects by contemporary Italian expats: Architecture and Vision, Atelier Manferdini, Alessandra Cianchetta, Delugan Meissl, Djuric-Tardio Architectes, Durisch + Nolli Architetti, Barozzi / Veiga, ecoLogicStudio, Benedetta Tagliabue, gravalosdimontearquitectos, Vittorio Garatti, KUEHN MALVEZZI, LAN Architecture, Marpillero Pollak Architects, MORQ*, Paritzki Liani Architects, simone solinas, ssa | solinasserra architects, 3GATTI. The Maxxi installation is brilliantly conceived by New York City–based Italian architectural firm LOT-EK, who's signature shipping container architecture perfectly suits the "movement" theme underlying the show. 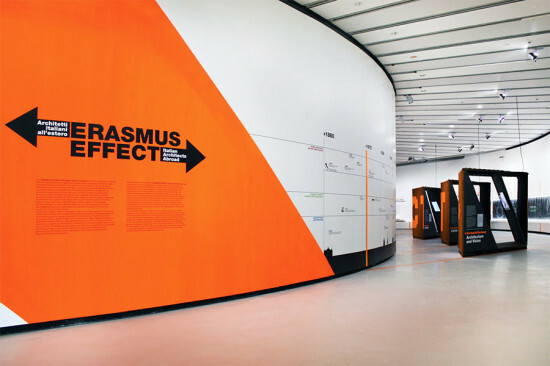 Erasmus Effect opened December 6 and continues through April 6, 2014. 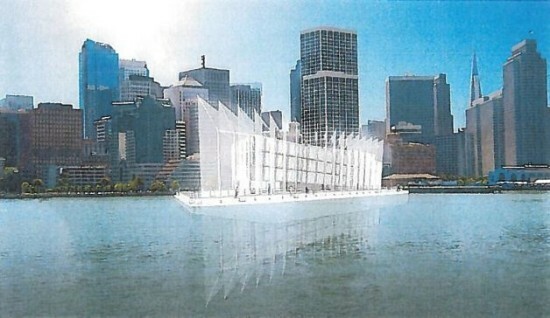 The rumors are true: Google is building that barge docked at Treasure Island on the San Francisco Bay. Last week, the San Francisco Chronicle uncovered documents submitted to the city by By and Large, a company connected to Google, that revealed plans for a "studio and tech exhibit space." The 250-foot-long and 50-foot-tall structure is being built from welded recycled shipping containers, with the design led by two coastal firms, Gensler in San Francisco and LOT-EK in New York. The project will include over a dozen sails resembling fish fins, to help provide shade and shelter, and come foul weather, the ability to be lowered. The barge will make the rounds throughout San Francisco, stopping at several docks (each for a month), including Fort Mason, Piers 30-32, and Angel Island, among others. It will eventually make its way down to San Diego and other port cities along the west coast. The exhibit is expected to receive up to 1,000 visitors a day. Three additional barges in the works. Read more about Google's plans here.